Day 3 was officially a “rest day”, although the plan was never to rest but to hike up Cloud’s Rest, a peak in close proximity to and higher than Half Dome in Yosemite. Cloud’s Rest was a magnificent day hike, climbing up through groves of trees to more exposed granite slabs. I grew more and more fascinated by the trees the longer I spent on the JMT. Some are twisted, some tall and straight, some with scaly bark, some with no bark. They are frozen in some form of agony or ecstasy, contorted towards the sky or erect like columns. The view from the top of Cloud's Rest was extraordinary, although we shared it with a large group of noisy boy scouts. Although I enjoyed the day hike, I was excited to make progress on the trail itself. That's one conflict I felt while thru-hiking - the only hiking that feels like 'real' hiking is distance along the trail itself. After several days of ‘late’ (thru-hiking time late, that is) departures, we decide to shoot for a 7 am departure for our hike to Cathedral Lakes. It would be the longest day so far at 11 miles, and we wanted to do as much of it as possible before the heat of the day set in. This resulted in everyone stressing and rushing around. Despite a chaotic morning, we were off by 7:10. I started to feel like I needed some time alone, but it was such a hard thing to voice without seeming angry or like I didn’t enjoy the groups company. When we finally started hiking I accelerated at a pace I didn’t think anyone would care to keep. I was right, and I keep my distance for the first two miles through the trees, calming down. We were making progress on the trail. The trail crosses Sunrise Creek and then dovetails it, growing steeper up the shoulder of Sunrise Peak until it transitions into switchbacks. I felt glad we were doing this hike in the cool of the morning. I was also more comfortable in my backpack than the days before, but it was still easily a third of my weight. Slow and steady up the hill, I thought. I stuck my thumbs under my shoulder straps to get the tension just right. At the top of the switchbacks, we met our first fellow southbound JMT hiker. 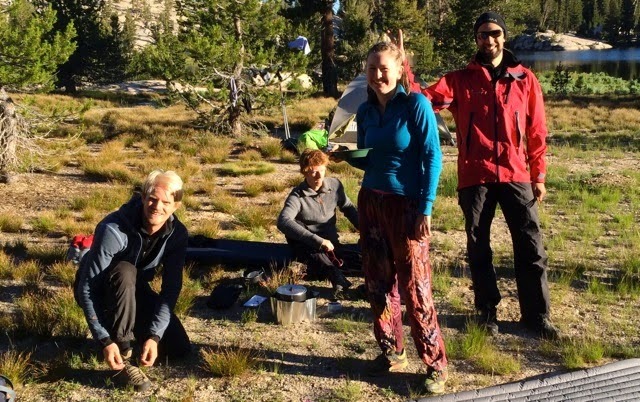 Susanne had a tiny backpack compared to ours, and had attempted the JMT once before, but later in the season. 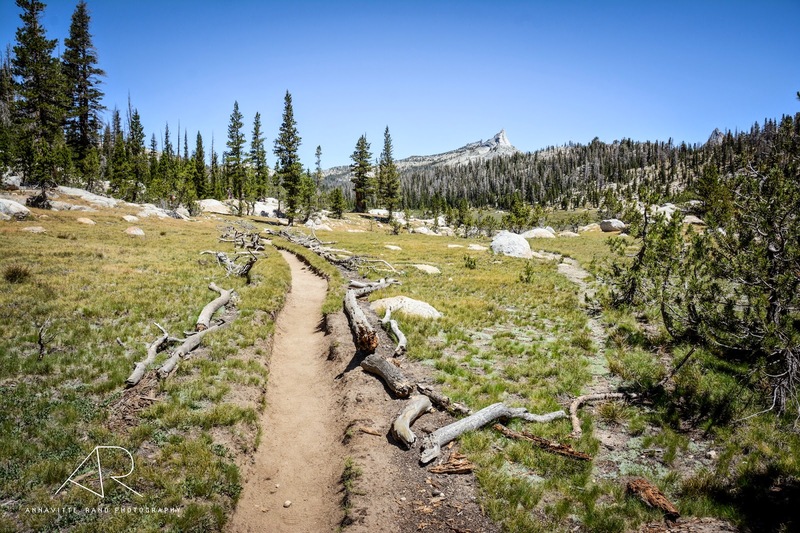 I am so getting ride of some stuff in Tuolumne Meadows! I thought to myself. As we hiked down the slight incline towards Long Meadow, we discussed things that we didn’t need in our pack. I had been favorably surprised by the trail conditions so far. I was hiking in Cascadias (trail running shoes) - in Norway you could never do a hike like this is anything less than hiking boots. The trails are simply too rough. But in the Sierras dust is more of an issue. It filters through your shoes leaving your feet brown by the end of every day. The rocky soil and contorted trees give way and open up onto the verdant Long Meadow. There is a High Sierra Horse Camp there, empty when we passed by. We stopped by the meadow for an early lunch, and ate tortillas with tuna and parmesan, peanut butter and Nutella. After lunch, as I finished traversing Long Meadow, I start to feel dizzy and overheated. My stomach churned - maybe these big lunches aren’t such a great idea after all. I dipped my bandana and shirt in a small creek, which made me feel less overheated at least. Then the trail reenters the beautiful trees and the blessed shade, and starts to climb toward Cathedral Pass. I was hiking with Annavitte and Karin, but I felt so slow, so I hung back. Pokey! I thought, One foot in front of the other. The spectacularly pointy Columbia Finger stuck up above us. I wondered how hard it was to climb it. A large group of Japanese tourists met us heading down. They all wore long pants and shirts, some with bandanas covering their faces. What a different way to deal with the heat! As I wonder what got them to travel this far to hike, and then I remembered that I came all the way from Norway. As I crested the top of Cathedral Pass, a whole new view opened up below me. The mountains were grey, slabby spires extending far into the distance. Trees sprouted from the rocks of the distant peaks like a sparse beard. In no time, we hiked down the hill to Cathedral Lake, and find a small campsite where we could pitch our three small tents. Then everyone wandered down to the sparkling blue lake to swim. It was the perfect temperature, and we lay on a warm rock in the sun before going in again. Cathedral Peak towers above us. It is another perfect campsite. Later in the evening, we lay around looking at Cathedral Peak through the binoculars (no wonder our packs are so heavy!). There was at least once group of climbers headed up the east ridge, and we could see some people on the very top of the sharpest spire. Then I noticed a group of climbers, noticeably so by their dangling racks on their belts, hiking along the lake near our campsite. They stopped by the large rock we sunbathed on earlier, and stripped down to go swimming. “Climbers!” I exclaimed to Zoe, Annavitte and Karin. “Are they good looking?” we jokde, and I trained the binoculars on them. But there was something eerily familiar about the white-blonde hair of one of the boys. Could they be…? I snuck towards the lake. They were actually speaking Norwegian! “Andreas?” I called out, “Sigmund? Erlend?” It was my friends from Norway, who randomly had planned a trip to the same area of California as me at the same time! They had climbed Cathedral Peak earlier that day, and showed me pictures from their climb. They pitched their tent near us, and we chitchatted until hiker midnight (way passed dark). It was a hilarious coincidence. I woke up in the middle of the night, the full moon shining on my face like the headlight of a car. The landscape around me was drenched in moonlight. It made it hard to sleep, but was oh so beautiful. Oh the JMT! I hiked it in 2012 and loved it. I had the same issue with hiking in groups. I need to read your other segments!